There’s a new bullet available from our Alliance series and this is a serious camera. It works with HD-TVI, HD-CVI, AHD and Analog technologies. This is a 2MP/1080p IP66 rated weatherproof camera that can be used indoors and outdoors with confidence. It has a dark gray housing that matches the look of some of our other Alliance series cameras and is great for just about any application. You can switch to the technology that works best for you and if you have one of our Tribrid, Quad or Pentabrid DVRs, this comes in handy if you have older cameras that you’re not ready to get rid of. Each of the technologies works with a standard coaxial cable and a 12V DC power supply so many of you will have everything in place from previous Analog camera installations. This camera has features that are meant to make it the go to camera for what you need. With the 2.8-12mm motorized zoom lens, you’re not going to need to climb a ladder just so you can change your view. Zoom in and out, at your will from your desk, living room couch, home office, or from your smartphone! 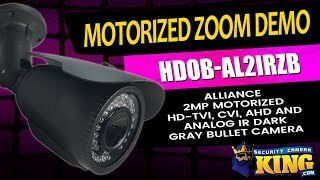 This is not a PTZ, so if you want a camera that moves up or down and side to side, you should check out our PTZ Cameras and complete your security camera system with some of our new Pan Tilt Zoom cameras! 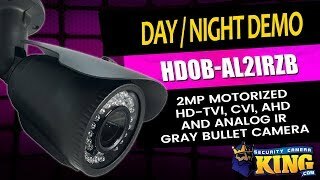 These cameras even come equipped with some high power LEDs that allow you to see up to 131 feet in low light and total darkness thanks to the built in IR (infrared). Time to put criminals on notice and let them know that they can’t escape your view . . . even in the dark! This camera is built to last and will come with a 1 year warranty, FREE tech support based right here in the USA and FREE remote viewing apps!